Back in the ‘80s, I’d often drive by a billboard that read, “If you lived here you’d be home by now.” I liked the sound of that, even though the sign was used to sell on-ramp-adjacent condos near a high-density traffic patch on a freeway commuter route. You have to figure the campaign was conceived by a Don Draper-styled (m)ad man (or more likely his underpaid female assistant), though whoever came up with it knew about creating the essential connection between consumer goods and comfort: It’s what we human creatures crave, and if cash can buy it, it’s hard for the body to resist. Which I guess is why I like the line, “Home is where I want to be / But I guess I’m already there,” from Talking Heads’ song, “This Must Be the Place (Naïve Melody).” It’s one of their atypically earnest love songs; the melody is simple and the groove flows in unity with the words. “This Must Be the Place (Naïve Melody)” isn’t cluttered with Talking Heads-style nervous energy or ticks; rhythmically it’s in the pocket, and the whole jam is comforting and warm—two words I generally don’t associate with their music. Best of all, this “home” isn’t asking you to buy it; you can live there as long as you like. It might just be the best song they ever made. “This Must Be the Place” earned its parenthetical “naïve melody” for the way it was recorded: The band used instruments that were otherwise not assigned to them. Tina Weymouth traded her bass for Jerry Harrison’s guitar, who in turn cradled the bass; David Byrne plays the keyboards. Special guest Wally Badarou sits in on keys, and downtown performance artist/percussionist David Van Tiegham bangs on bottles and other items. Placed as the last track on Speaking in Tongues, the album would become the band’s first million seller, and might’ve been overlooked were it not released as a single following “Burning Down the House.” It was further enshrined in the band’s mythology when they performed it on the Stop Making Sense tour. 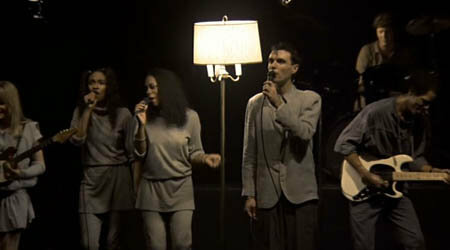 Preserved on film by director Jonathan Demme the Stop Making Sense performances (widely considered to be a masterpiece of the concert movie genre) marked a unique time in the band’s history: Working in an expanded lineup and at the height of their creative and live powers, the circumstances at home in the band were less than harmonious. Tensions were highest between Weymouth and Byrne, though it didn’t dim the dance that takes place between him, the band, and a lamp in the live show. The studio track has enjoyed many further subsequent celluloid uses, perhaps most notably in both Wall Street films, though it’s funny that the Talking Heads most unironic song is used with a twist: “Never for money, always for love,” as the line says. Since its recording in 1986, the song remains one of the most-covered of all Talking Heads tunes—it may in fact be one of the most done songs by an alternative band from the mid-‘80s, period. Versions of interest include those by MGMT, Animal Liberation Orchestra, and the String Cheese Incident. Singer-songwriter Shawn Colvin was performing it and turned in a meek version on Cover Girl back in 1994. The Arcade Fire really got the contemporary revival of the song going somewhere in the middle of last decade when they too started performing it live; they released a version of it recorded at Irving Plaza in New York with David Byrne as the b-side to their 2005 single, “Neighborhood #3 (Power Out).” TV on the Radio’s Kyp Malone paid homage to the song, bearing out Talking Heads’ status as the ultimate touchstone for East Coast art-rock stylists. But here’s the real test: How many ‘80s classics can survive a kid’s chorus? Talking Heads and these kids at New York City’s PS 22 pass the test. “This Must Be the Place (Naïve Melody)”” was the cozy final track on Speaking in Tongues which made way for the Little Creatures album, an even warmer, some might say folksier, version of the Talking Heads. With cover art by primitive painter Howard Finster, the Talking Heads expanded on their urbane landscapes and reached into the Americana tool kit of twang; they told tales of newborn babies for their now older audience who they helped educate, listeners who may’ve come up hard and punk, but who now weren’t averse to a little slide guitar in the mix. But while the Talking Heads had finally arrived at the top, the bottom was officially falling out of the band and within a couple of years, the split was official. Filed under: Origin of Song, Naïve Melody, song stories, Talking Heads, What's that song? Stop Making Sense really broke ground in the concert movie genre. I think The Police Synchronicity concert movie was the most popular concert video before that. Hi Denise. Just finished reading Byrnes’ new book How Music Works (a gift from my wonderful son). A very interesting look at music from almost every angle. Love to hear your thoughts on it if you read it.